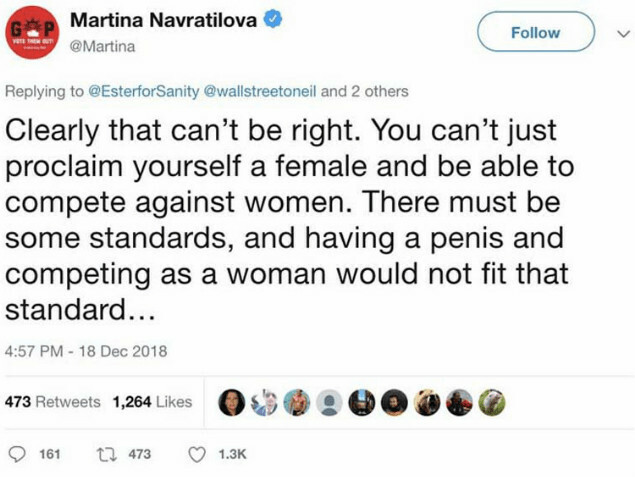 Tennis legend Martina Navratilova was forced to apologize for comments she made on social media saying that natural born men who ‘proclaim themselves female’ should not be allowed to compete against women. Navratilova’s remarks came in response to a question from a Twitter follower who asked her about transgender women in sport. As soon as she posted her message angry responses and calls to apologize flooded Navratilova’s twitter account, forcing her to delete the initial post. Canadian transgender cyclist Rachel McKinnon was among the most outspoken critics who said that the tennis legend should be “accountable for public transphobic comments” made against people of alternate birth gender. …wow. Martina, engaging with you and holding you accountable for your public transphobic comments is not ‘bullying,’ and is not ‘nasty.’ I hope you see your way to regretting how you’ve handled this. Navratilova’s opinion on the topic came as a shock to many, as being an open lesbian herself the tennis star has always been a LGBT rights campaigner. You’re the real hero here Martina. The truth is painful to some, but that doesn’t mean it shouldn’t be spoken. These bullies need to sit and reflect. Having a different opinion doesn’t make someone “phobic”. Let’s discuss this rationally, not shame people into backing down. It’s incredibly disappointing that you’ve been intimidated into backing down from telling the truth.